This dramatic painting by Benjamin West commemorates the 1752 experiment in Philadelphia in which Benjamin Franklin demonstrated that lightning is a form of electricity. West was born in Swarthmore, Pennsylvania, in 1738, when the American colonies were still part of the British Empire, and became an renowned history painter and the second president of England’s Royal Academy of Arts. While in London, West befriended Franklin, a fellow Pennsylvanian, but did not render this likeness of the celebrated scientist and American statesman until after his death, creating it as a study for a larger, unrealized portrait that he planned to give to Pennsylvania Hospital, an institution Franklin founded in Philadelphia. West intended to display the larger picture with another of his compositions and a self-portrait, perhaps as an homage to Americans who had achieved international acclaim in science and the arts. The painting is a sketch for a large-scale portrait, never executed, that Benjamin West planned for the Pennsylvania Hospital in Philadelphia. It shows Benjamin Franklin engaged in the famous experiment of June 1752 that proved that lightning was electricity. 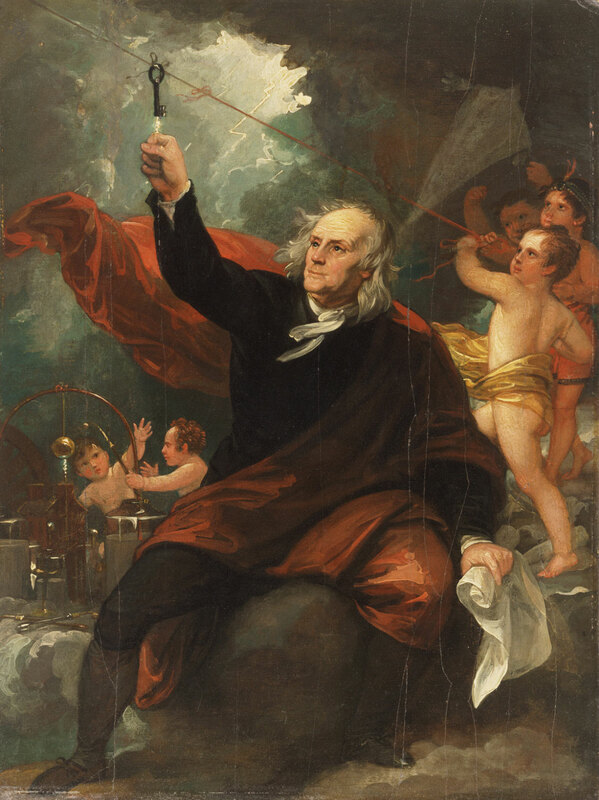 West depicts the moment when a spark of electricity, passing through a key attached to a kite flying in a stormy sky, jumps to Franklin's raised knuckle. The scene rises to the level of allegory, however, with Franklin perched on clouds and surrounded by angelic assistants. Although West and Franklin were friends in London between 1765 and 1775, and the statesman/scientist was godfather to the artist's second son, the portrait was not done from life. Rather, West seems to have relied on an engraving or a copy after a miniature portrait by the French artist Jean-Baptiste Weyler of about 1782. Christopher Riopelle, from Philadelphia Museum of Art: Handbook of the Collections (1995), p. 184.